Fiend Statues are hostile creatures found in The Dark Room of the Endless Stair. They are re-animated versions of stone statues found around Coldharbour. 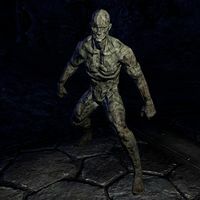 They use the same stone-like skin as the Hollow, but whereas the Hollow's base race is Altmer, Fiend Statues are Imperial. Some Fiend Statues in the Dark Room are not creatures, but rather non-interactive activators that stay in one spot and periodically deal damage. This page was last modified on 5 February 2019, at 05:27.